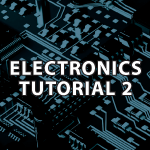 Welcome to my 2nd electronics tutorial. If you missed the 1st video watch it first. This time well learn many of the basics that you’ll need to start making and understanding circuits. I’ll be covering Current Flow, Reading Schematics, Using Multimeters, Voltage Drop, Series Circuits, Parallel Circuits, Using Bread Boards, Switches, Resistors in Series, Resistors in Parallel and more. Bread board photos are below so it will be easy to make the circuits. I’ve also included a transcript of the video plus more info not covered in the video below. Consider supporting my tutorials on my Patreon Page. A. (Slide 1) Electricity is the flow of electrons through a conductor. F. (Slide 4) The build up of charges or the potential amount of charges available is called the voltage. G. (Slide 5) The movement of these charges in the same direction through a conductor when an external force is applied is known as current. The force is voltage. One ampere (A) is equal to 6.241 X 10 ^ 18 electrons passing a fixed point in a second. The symbol I represents the strength of a current. One Coulomb is the amount of charge carried by one amp of current in one second. H. (Slide 6) When charges move another field is created called the electromagnetic field. The force that pushes electrons is called the electromotive force, or voltage. Like water pressure pushes water, so does voltage push electrons through a conductor. The higher the voltage is the stronger the electric current is that flows through the conductor. I. These fields force the electrons to move through a conductor. D. Power is the total energy consumed while doing work over a period of time. It is measured in Watts (W). Every component has limits in regards to how much power it can handle and pushing beyond that point will generate heat which will destroy that component. K. (Slide 8) Resistance in a circuit is similar to the effect you get by adding a smaller tap to your water tank. Resistance can also be compared to how much harder it is to pull a heavy object over a rough surface versus a smooth surface. Gravel is high resistance / friction versus the low resistance / friction of pulling an object over a sheet of metal. L. (Slide 9) Resistors use a color code system to define how many Ohms of resistance they provide. b. A Load, which is something that absorbs this energy such as the LED. Without the load the heat energy can melt the wires and cause the battery to explode. N. Batteries provide a flow of electrons in one direction (Direct Current), while an electrical outlet provides a fluctuating flow that changes direction. a. People used to think electric current was the flow of positive charges, so they described current as the flow of a positive charge from a positive terminal to a negative terminal. Then they discovered that negative electrons flow from a negative terminal to a positive. The original still sticks though to this day called the Conventional Current Flow in which current flows from the positive to the negative. So if you see a description of a circuit know that it uses the Conventional Current. e. The LED has an arrow pointing in one direction because current can only flow on one direction because it is a diode. The arrows show that it emits light. a. In our circuit the battery supplies 6 Volts. b. A 470 Ohm Resistor limits the amount of current that flows through the circuit so that the LED isn't damaged. A. A multimeter can measure changes in voltage, resistance and voltage drops. B. Measure the voltage provided by the battery by putting 1 probe each at the points where the battery packs wires enter the bread board. You should see 6 V.
C. Measure the voltage across the resistor by putting a probe right where the postive terminal enters and on the opposite side of the resistor. You should see 4 V.
D. Measure the voltage across the LED by putting a probe on both sides of the LED. You should see 2 V.
E. The voltage drop sums across the resistor and the LED will equal the voltage supplied by the battery. a. The voltage from the battery gets the current moving and some of that voltage is absorbed by the resistor and LED which causes the voltage to drop as that energy is used up by the components. F. To measure current you must interrupt the circuit between 2 components and use your multimeter to complete the circuit. Turn the multimeter to DC mA. Pull up the jumper wire next to the negative terminal and measure from the LED to the exposed jumper wire. You should get a reading of 8.31 mA, or 0.00831 A.
a. If you pull up the jumper between the postive and the resistor you'll get the same current. e. The resistor converts the energy to heat and the LED converts it into light. G. We can measure the resistance by changing to the Ohms dial on the multimeter and then touch both ends of the resistor. A. How you connect components determines how voltage is dropped. a. With parallel connections if one component fails it won't effect the others. b. The voltage across each branch is the same. c. The current supplied by the battery is divided among the branches and those branch currents sum to the total supplied. a. Earth ground is a direct connection to the ground. In your house the third prong in an outlet connects to a metal post that makes contact with the ground. This provides a dangerous current with some place to go. b. Common ground in a circuit is labeled as the negative terminal of a DC power supply. a. (Slide 13) Switches make or break 1 or more connections. The connection can either be broken or redirected down a different path. b. 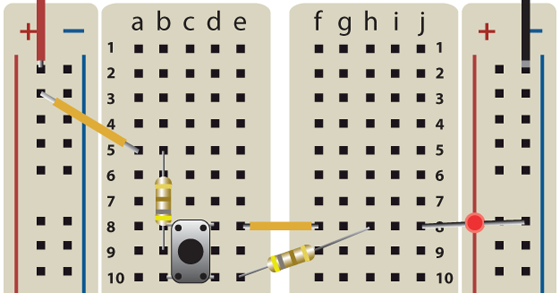 There are many different switches that are defined by how they mechanically work and the number of connections they can make. 1. There are slide, toggle, rocker, pushbutton and relay switches to name a few. 2. A relay switch will open or close a switch based on the amount of voltage it is receiving. 3. A single pole switch has one input contact. 4. A double pole switch has 2 contacts. c. (Slide 14) With the slide switch (SPDT) you can set it up as a On / Off switch or as a 3 pin switch with 1 common center pin and 2 pins that vie for the connection. d. With the push button (SPST) you have a momentary switch that is on or off. Place it on the board with the bands on the botton horizontal. a. Resistors slow the flow of electrons. They are used to lower voltages to a desired level. a. Resistors in parallel are side by side versus one after the other.You can decrease resistance by adding resistors in parallel. Let's test on the breadboard and then look at the formulas used to calculate resistance based on the use of parallel resistors.